I’ve often wondered what makes some performing artists shine while others, equally talented, don’t register for me in that same way. The three new works on the program—by Gabrielle Lamb, Ihsan Rustem and Artistic Director Olivier Wevers—offered the very accomplished Whim W’Him company members both challenging and beautiful choreography. But two of the evening’s offerings gave me the opportunity to think specifically about each Whim W’Him dancer, because Lamb and Wevers’ choreography really highlights individuals and duos, rather than ensemble movement. 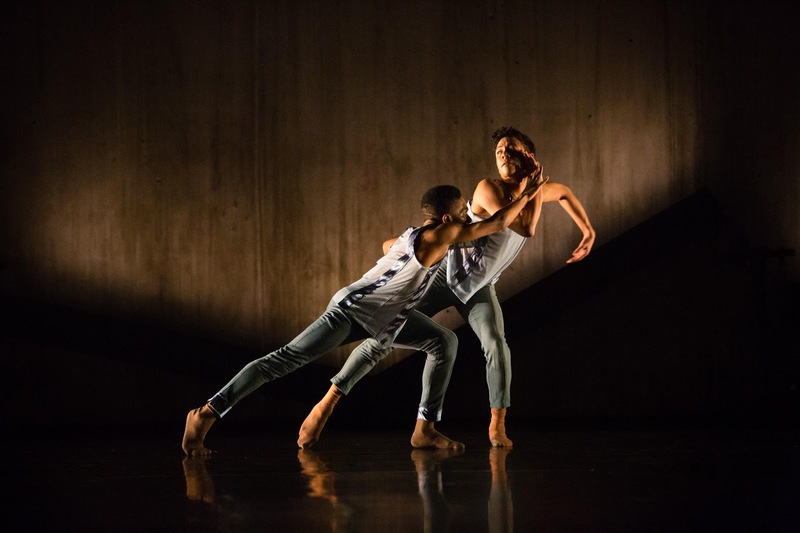 Lamb’s piece, “Joinery,” was about just that: joining, and ‘un-joining.’ Much of her choreography is angular: elbows and knees act as pivot points for arms and legs. Lamb also emphasizes articulation, with toes alternately pointed and flexed, fingers splayed. “Joinery” is moody and contemplative, with a wonderful wow of an ending. Cameron Birts, left, with Jim Kent in "Joinery"
Most impressive to me were Jim Kent and Cameron Birts in a duet lit from the front, which cast their large shadows on the bare wall at the rear of the stage. From Whim W’Him’s inception, Kent has been a steady, sometimes brilliant, presence. Birts, a new company member this season, matches Kent in height, but he possesses super long arms that fascinated me. Together in this shadow dance, they were riveting. In his latest offering, “6 love letters,” Wevers demonstrates his skill with the pas de deux, something longtime Whim W’Him fans have seen since his earliest work. I was particularly struck by the section ‘to an ex’, performed by Tory Peil and Adrian Hoffman. Hoffman, another recent addition to Whim W’Him, is a delight. Not only does he bring technical competence; he’s got an inner spark that really elevates him as a performer. In this particular pas de deux Hoffman is a great match for Peil; they’re both tall, elegant movers. But Hoffman brings the added dimension of dramatic flair, as well as musicality. He didn’t dance to the music, he embodied it in a way the best dancers do. I should say that all seven of the Whim W’Him company members are talented and well-trained. They dedicate themselves to the material at hand and always deliver excellent performances. But it’s a special treat when a dancer like Hoffman shows up in town. Although I’ve singled out Lamb and Wevers’ works on the Configurate bill, I have to say that Ihsan Rustem’s “Seed” was the evening’s highlight for me, despite technical difficulties that required the performance to stop, then re-start. 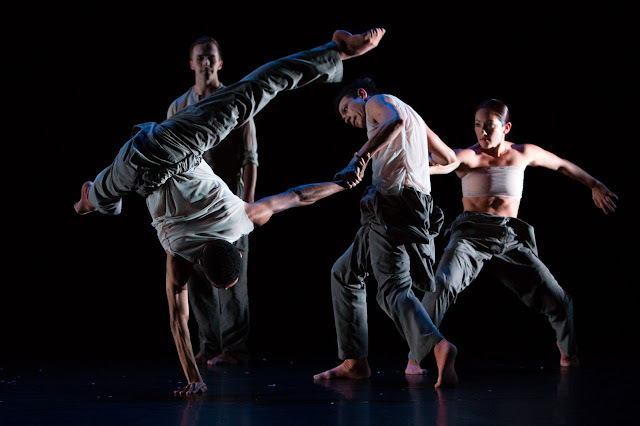 “Seed” is the kind of dance that surprises and, for me, delights. It’s a narrative, of sorts, full of ensemble action, and quirky humor. And it showcases the dancers in the best possible way, playing to each of their individual strengths. Rustem has worked for companies around the world; lucky for us that Wevers has brought him to Seattle twice (so far).